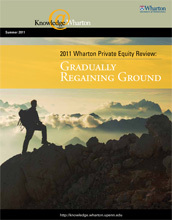 Wharton Private Equity Partners (WPEP) is pleased to share with you an electronic copy of the Wharton Private Equity Review. WPEP is committed to maintaining Wharton’s position as a thought leader in private equity and is delighted to be the charter sponsor of this publication. The Wharton Private Equity Review is created by current MBA students in conjunction with the editorial staff of Knowledge@Wharton. The financial meltdown of 2008-2009 and the resulting global recession dealt a painful blow to private equity investing, and the industry is still recovering. Knowledge@Wharton’s special report, based on the 2011 Wharton Private Equity and Venture Capital Conference, examines the industry’s gradual comeback. We invite you to read the full report and gain valuable private equity insights by visiting Knowledge@Wharton’s Private Equity site at http://knowledge.wharton.upenn.edu/weblink/807.cfm. We are confident you will find the articles and interviews of the Review to be both enlightening and thought provoking. For your convenience, links to individual articles are provided below. Forward-looking private equity investors can still reap strong returns from global growth opportunities, despite the powerful headwinds that are buffeting the U.S. economy. That was the assessment of Glenn Hutchins, co-founder and co-chief executive of private equity firm Silver Lake, in a keynote address during the 2011 Wharton Private Equity and Venture Capital Conference. Although high unemployment, excess capacity and a backlog of unsold housing remain problematic in the U.S., technology and booming economies in Asia and the developing world offer a wealth of prospective investments, Hutchins said. Private equity investors are increasingly focused on strong middle-market companies that are ready to expand. Investments in such companies demand less capital than larger deals and have greater flexibility when it comes to cashing out. This makes middle-market investing particularly attractive to private equity firms at a time when money remains tight and fund-raising is challenging in the wake of the global recession. The prospect of reaching vast numbers of new middle class consumers in emerging markets is a driving force in international private equity and venture capital. In China, India, Southeast Europe and Latin America, sizable populations of young consumers are eager to enjoy the goods and services available to those in the United States and other developed countries. Top targets for investment in these emerging markets include companies in the Internet, financial services and clean technology sectors. Troubled companies that have been hoping for better times will soon have to turn to private equity investors for sorely needed funds. That was the consensus of a panel on distressed investing at the 2011 Wharton Private Equity and Venture Capital Conference. Companies that have renegotiated bank loans six or seven times will need to resort to other options, the panelists said. Among the sectors most likely to provide distressed opportunities are real estate, finance and health care.